Produced by Dr. Spencer Striker, Digital Media Professor at the American University in Dubai, the show is created with the help of a talented student production team at AUD. Maria: having graduated from the American University of Beirut, with a Bachelor of Science in Nutrition and Dietetics, Maria moved to the United Arab Emirates to pursue her career in nutrition working in different areas from individual counseling to community work, as well as a full-time role in the food service industry. Maria is a certified Eating Disorder specialist, where she counsels and helps many individuals suffering from anorexia, bulimia and other related eating disorders. Nadine: born and raised in the UAE, Nadine is a graduate of Canada’s McGill University where she attained a Bachelor of Science Degree in Nutritional Science. Nadine moved back home to the United Arab Emirates to build on her career in nutritional services, from one-on-one nutrition counseling and personalized dietary plans to community work as well as foodservice projects. She is a certified NLP Master Coach, as well as a NLP, Time Line Therapy™ and Hypnotherapist Master Practitioner; thus complementing her passion for creating a positive life and enhancing one’s well being by nourishing one’s mind, body & soul! Debbie: an ex-HR Director who has worked on complex mergers and acquisitions as well as being listed as one of Dubai’s top food bloggers by The National and with 30,000+ followers on social media, Debbie comes with tons of commercial experience which includes organisational, technical and project management skills. 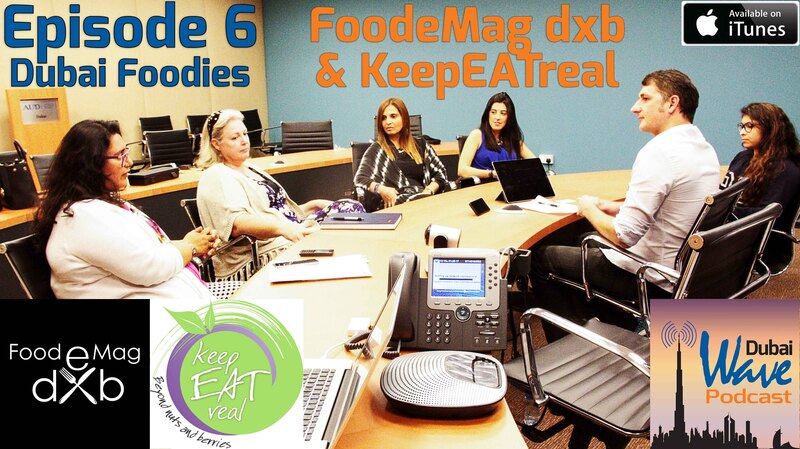 These are some of the ingredients that she infuses into FoodeMag dxb, so that the right-brain inclined editorial team is on track! Ishita: is obsessed with street food and learning about culinary cultures across the world. She aspires to travel the world with her family – husband and two daughters – the Z-Sisters.Ishita is also the author of IshitaUnblogged, a popular culinary travel blog featuring Dubai & the world beyond. Described as one of the ‘Middle Eastern Food Blogs To Check Out’ in Fine Dining Lovers and featured in BBC Travel Show UK and the Travel Show in Dubai Eye 103.8 FM, the blog pens down ‘experiences’. The concept with Dubai Wave is to look at big picture Dubai. Each episode will focus on a unique topic, such as Dubai Fitness; Dubai Social Media; Dubai Food Scene; Dubai Music, etc., with the goal to illuminate a 360-degree viewpoint of all the exciting things happening here, the gem of the Middle East. The impressive guest list to date includes the founders of two of Dubai’s most popular food blogs (Dubai Foodie Scene); the founder of Dubai’s most influential MMA gym, Tam Khan (Dubai MMA); successful entrepreneur, Anas Bukhash (Dubai Entrepreneurship); the editor of What’s On Dubai, Laura Coughlin (Dubai Magazines); the host of Virgin Radio, Brent Black, (Dubai Radio). Previously, Dr. Striker, with help from talented Digital Media and MBRSC students, launched a successful podcast called Digital Media & Tech in Dubai, focused on the Dubai tech industry, with eight episodes to date, featuring some of Dubai’s most exciting digital thought leaders. Dr. Spencer Striker, Digital Media Professor at the American University in Dubai has launched a new podcast called Dubai Wave, produced by he and his students in a newly launched course called Digital Podcast Production.